“ Praja Sahayogitha Sansadaya” had taken the responsibility to organize the 11th General Body of NAFSO as its our Kurunegala District partner organization and there were around 200 participants representing from all partner organizations including North and East. Its is adopted near the Pothuwila river, which is located in Kurunegala District and Participants are selected to attend to the General Body Meeting According to the taken decisions of each regional committee meetings that they are having once a month. Among the reports that they presented are annual progress reports of each member organization and the major report of the NAFSO was presented by the Administrative Secretary (Geetha Luckmini) of NAFSO as well as the annual finance report presented by our financial officer Shanthi Kumar. 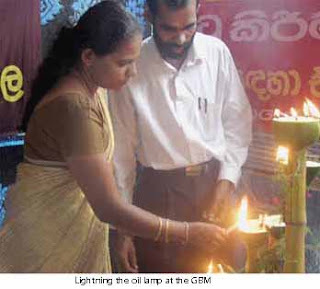 The newly elected chair persons to the National Committee for 2008 are Mr. A.M .Jagatha Chandrasiri ( A farmer from Karuwalagaswewa – Puttalam District), Ms. Kumari Fernando (A fisher women from negombo – Gampaha District) and Mr. Ansal Fernando form Galle (A fishermen – Galle District). All partner organizations had taken their district reports what they did in their district in the past to hand over to Administrative secretary (Geetha Luckmini) of NASO as well as this would be a very valuable meeting because new office bares also were elected for the National committee for next year and they will work in that as National Committee members for the sake of the people’s movement. In this 11th General Body Meeting we could review our achievements in 2007 and following are some of them. We could draw and attention from the government on destructive fishing gears to band them legally by ordering all police stations to arrest the fishers who use illegal fishing technology and people were well aware of on this matter. Building a women volunteer teem to support for the 4th General Assembly of the World Forum of Fisher peoples’ (WFFP) and to success of peoples animation proces. Fought against the exploitations of fish in the Sri Lankan water bodies by Foreign fishing vessels. Building a youth volunteer team to face in the disaster situation. Herman Kumara also attended this meeting to address the gathered participants as he is National Convener of NAFSO, not only that he was elected as Secretary General of WFFP for next three years on 3 .12. 2007 in the World Fisheries Conference of the World Forum of Fisher peoples (WFFP). The 11th General Body Meeting of National Fisheries Solidarity Movement (NAFSO) ended after having addressed the participants by National Convener, Herman Kumara wishing all a happy new year as well as inviting all to give their strength for success of this people’s movement.